Every employee on campus – from admissions to grounds keeping – might be able to learn a thing or two from their last car-shopping experience. “But car salesmen are shady” you could be thinking. Well what do you think about service professionals at banks, hospitals or even the United States Postal Service? The truth is, all of these industries ranked higher in customer service satisfaction than colleges, based on recent data from a national co-sponsored study by Longmire and Company. On top of that, 55% of students and parents questioned colleges’ commitment to provide quality service, based on their experience during the pre-enrollment process. Our study revealed that many colleges are currently flunking out when it comes to pre-enrollment service. Perhaps it’s time we look to other service industries and revisit Customer Service 101. Let’s go back to the car salesman example: Much like choosing a college, buying a car is an important decision, and a big investment. 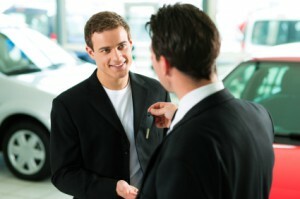 There are many dealerships to choose from, and aside from price, the purchase decision will be heavily influenced by the human interaction and overall experience that a customer receives when they walk through the door. Car salesmen and dealership owners know this, and the most successful shops invest in making the customer experience as positive as possible. They hire sales personnel who treat customers with respect and put them at ease. They ensure the grounds and waiting room are clean and comfortable. They offer beverages and send follow-up thank you notes. They adopt an overall attitude of helpfulness toward the customer. All of these seemingly small details contribute to establishing a sense of trust between the customer and the seller. And if something is off during the ‘browsing’ stage, there is little chance the customer will follow through to the ‘buying’ stage. A C-average is passable, but not impressive. These things matter significantly to prospective students and parents and enormously influence their final decision regarding which institution to attend. Bottom line: If a college wants to gain a competitive advantage and attract students, it must invest in delivering a higher level of personal service during the recruiting phase. The good news here is that it is not terribly difficult to improve the experience for prospective students. It starts with adopting a service mindset and getting the whole campus on board with attentiveness to student needs. If car salesmen can do it, surely our centers for higher learning can as well. Over the next few months, I will continue this conversation with more specific guidelines and tips for helping to improve the level of pre-enrollment service. We want to help colleges seize this opportunity to differentiate and attract more students through better service. In the next installment we’ll describe how to take a baseline measurement of your institution and determining a roadmap to better service. If you would like a copy of the results of our national study on pre-enrollment customer service, simply visit our Contact Us page and request it. We’ll send it to you right away.